The Gunpowder River is clear, flowing at 38 Cfs and is 41 degrees F. Weather this weekend should be on the warm side which may result in a nice bump in water temps. Stoneflies, BWO’s and cream midges will be part of the mix. 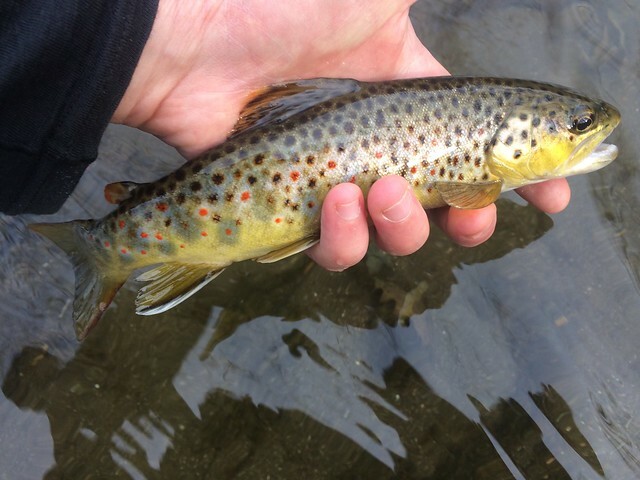 As the latest stream report will attest-fish those streamers people! Didymo is still about above Falls Rd so try a little lower if you’re dead set on nymphing. Thanks to Tom Starrs for the great stream report and photo. It’s been a while. I was just in the shop last Sunday, it was my first time at the new location. The shop looks nice as always. I spoke to Gene (the young man from the UK). We were speaking about the cold and clear water that we have been seeing so far this year in the tributaries (Little Falls, Beetree and such). It makes for tough fishing, the trout are little lethargic and they get a good look at everything you throw. I told him it would be good if we got a little rain. 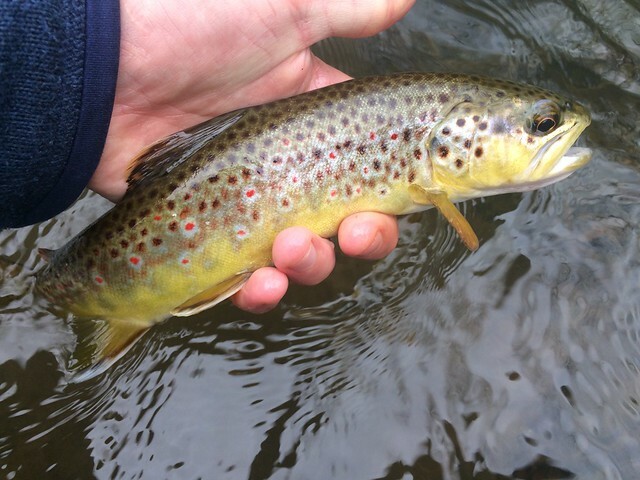 We talked about working woolly buggers on some of our exceptional area wild trout streams this time of the year, fishing the deeper holes and undercut banks where the trout will be holding. I picked up a few woolly buggers, some tippet and a new Backwater Angler hat.-Well we got some rain today. So I hit one of other streams in the Gunpowder watershed. The conditions were nearly perfect to give my new hat a workout! This entry was posted in fishing report on February 17, 2017 by Theaux Le Gardeur. 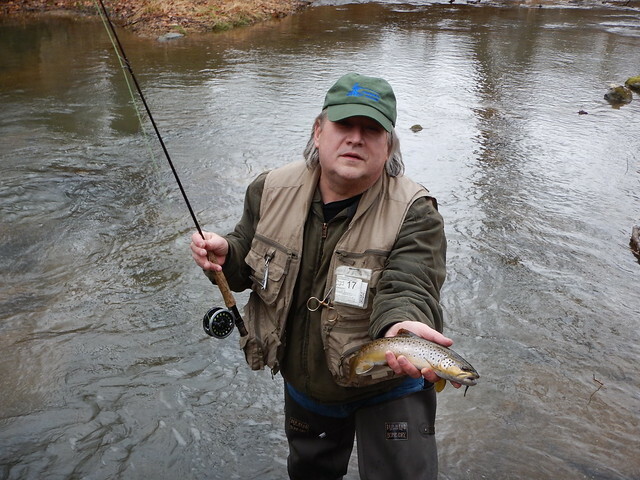 The Gunpowder River is clear, flowing at 38 CFs and is 38 Degrees F. Thanks to Gene for the Gunpowder stream report! Fishing has been very productive on the warmer days. You’ll see stoneflies skittering across the surface size 16 early afternoon. I’ve found the trout tend to ignore the adult but will be looking for the nymph in the riffles. American pheasant tails and prince nymphs imitate these well at the heads of pools. 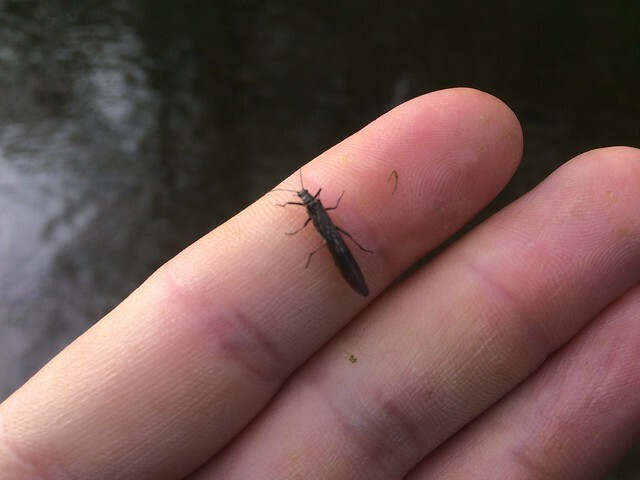 Midges (20 – 22) often hatch alongside them and you can find fish rising to these in the slacker water in the tails of pools. With the weather warming up this weekend rising water temperatures once again will provide good fishing opportunities between Falls to Big Falls road. Upstream from Falls to the dam is better fished with a streamer or small dry midge pattern. This entry was posted in fishing report on February 10, 2017 by Theaux Le Gardeur. Please join us for a fly fishing school. 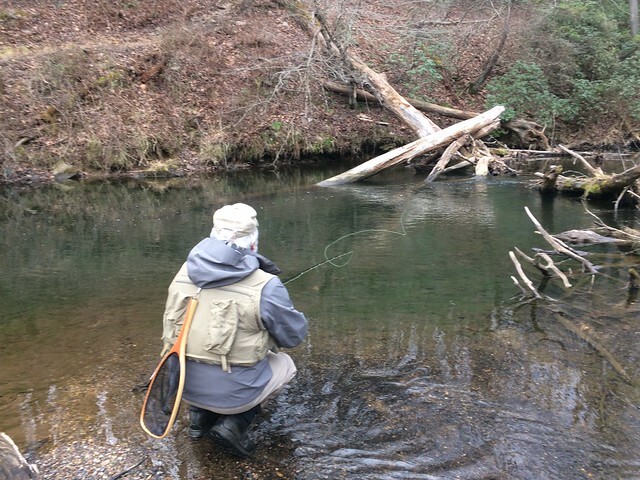 On Sunday, March 19th a Backwater Angler Guide will be teaching a fly fishing school that is ideal for beginners. If you’re planning on fly fishing in Maryland, or anywhere else for that matter, this course is a great introduction to the sport. The school covers knots, casting, gear and fly selection. Class is held from 11:00 AM till 2:00 PM. Cost is $125 per person and includes the use of gear. A Maryland non-tidal fishing license and trout stamp is required and may be purchased at the shop with check or cash the day of the school. Class size is limited to 4 and pre-registration is required. Please give us a call at 410-357-9557 to pre-register. This entry was posted in events on February 5, 2017 by Theaux Le Gardeur. The Gunpowder River is clear, flowing at 37 CFs and is almost 40 degrees F. Nymphing works this time of year. Dry fly fishing is not out of the realm. Chances are you won’t catch a fish if you are sitting on the couch. Remember-fly fishing before football. With the consistent water flow and the mild winter I have found the fishing to be very good for the time of year. Particularly following rain or during calmer conditions. Optimum fishing times are between 11-3 when the water temperature peak. Fishing nymphs; tungsten midges, prince and pheasant tail nymphs size 16 are working great in the faster water. As for dry flies, small crippled midge patterns and Mike Bachkosky’s cream midges (size 22) which we have in the shop are great at this time of year in the calmer water. I was out with Darin Crew for a few hours on Tuesday, fishing a tandem nymph rig under an airlock indicator was productive once the temperatures rose above 40 degrees. The best of the bunch caught by Darin was a robust wild trout in the region of 15 inches which engulfed a red zebra midge. We saw clouds of small cream midges and a good amount of black stoneflies coming off the water from midday til 3pm and the fish were rising in the slack water for the midges. Everyone should take some time to enjoy this pleasant weather we’re having and spend a few hours on the Gunpowder! This entry was posted in fishing report on February 2, 2017 by Theaux Le Gardeur.